My birthday approached this year in 2014, while two weeks before while at an ashram, got a strong desire to meet Amma and Baba, two great Avdhoots in Kerala, assessable to general public but hidden under the disguise of illusory conditions. I had met them before twice during my Kanhangad visits. This birthday, as many other, thus I desired to be in the lap of Bhagwan Nityananda in Kanhangad for it were by His grace I was reborn 5 years back. A quick call to three friends confirmed that they were also free and soon we found ourselves in Kanhangad on a day in February. The first day we spent at the holy caves in Kanhangad ashram and immersing ourselves in just ‘being’ in this divine place, frequenting between the caves, the Samadhi temple, and our rooms. 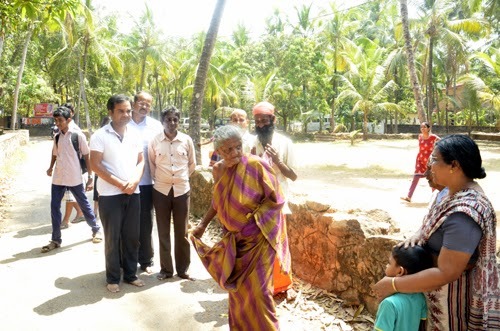 We divided our three-day visit – first day, in Kanhangad ashram and the 43 caves. Second day meeting the Avdhoots Amma and Baba. Third day – with Swami Vidyananda in Guruvan at Bade Baba’s holy cave and temple. 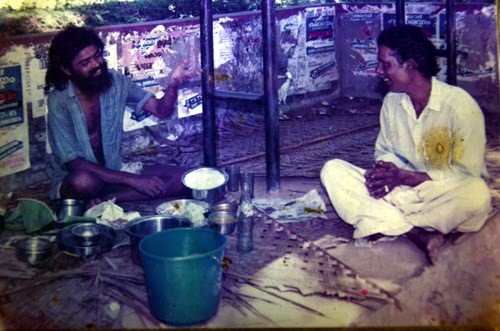 The first day pleasantly passed and next day got up early as we had booked a taxi to travel to Talacheri and Quilandy where Amma and Baba lived amongst the people, heavily mistaken to be as ‘crazy’. We had to cover about 225 kms one side and hence, left Kanhangad ashram at 5:30 a.m. as planned. 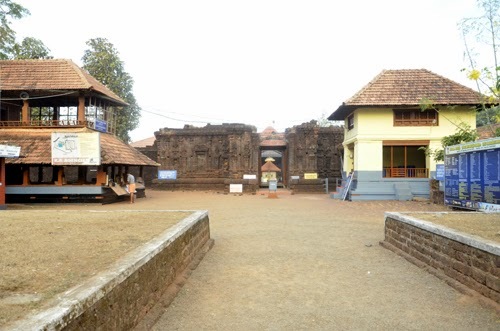 We halted briefly at Raja Rajeshwara temple at Taliparamba, which is a powerful Shaktipeetha, which is believed to be the place where Maa Sati’s head fell. 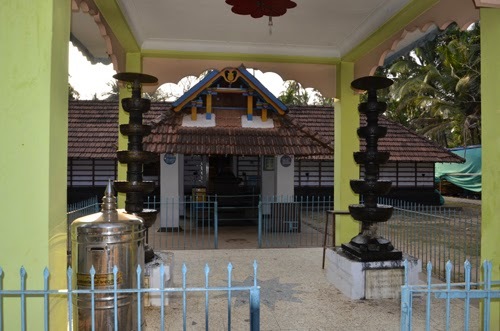 This temple had a jyotirlingam that disappeared into the ground and also is known to be the place where Parushram frequented and also which held the ashram of Sage Agastya. Since the temple was not open yet, we just were there in the vicinity of this place for sometime and we then proceeded further. After stopping for breakfast in Kannur, we proceeded straight to Quilandy with a few bags of rice and also few other ingredients to be given to the locations we wanted to go. Agarbathi packs were often what we carried to Achar Baba. 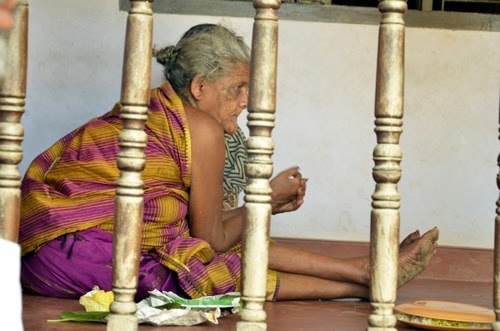 Amma lives in a house in Talacheri and is often found wandering on the streets absorbed in divine bliss at all times. She does not speak, and if she does it is not easily understandable. She gives darshan only if she wishes, by being present in the home or by ‘being seen’ anywhere outside, otherwise it is not possible to meet her. This time, we just prayed, we get to see her. This time’s visit was a little special because all of a sudden while meditating one night, I had got her ‘call’ and without any hesitation had booked off the tickets to Kanhangad, being happy that it coincided with my birthday plans. Suddenly, we spotted her standing at a cross road just before reaching the place she stayed. Halting the taxi abruptly we jumped out and went and fell at her feet, while she looked at each as though one’s eyes tries to look deeply into identifying a person’s face after coming from bright light into darkness. Just as all finished touching her feet, she walked off and moved around in that place for a while. We stood there for sometime and when we saw that she was keen on being there, we decided that we walk to her place and sit in meditation. If it was her wish, she would come there, as it had happened twice earlier. But then, just as we began walking on one side of the road, we noticed that she also began walking on the other side of the road towards her place of stay. I was overjoyed on knowing that Amma was moving towards her home which was a great sign of her acceptance of giving us ‘time.’ She walked, we followed her footsteps. After reaching the gate, she turned around and looked and I acknowledged her love by stopping and shyly putting my head down. She then walked into the home and we followed. 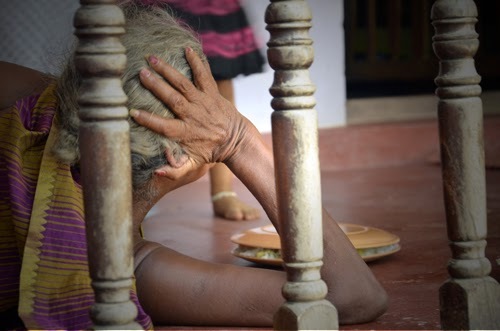 She went and laid down on the floor in the verandah, which was her place of rest. This is where she had given us ‘time’ the last two times, in the same way! We, without wasting any time, touched her feet and closed our eyes in meditation. Tears of joy flowed in me by understanding her love that she gave through this simple yet divine act. How foolishly people misunderstand the play of great souls! Amma's collection of dolls under the sheet. ne of which our limited minds could decipher We just sat there talking to ourselves. Then, Amma who must be in her 80’s walked out in her one piece of saree that she wore, seemingly to just cover herself to public modesty. However, at times she was seen to be without it. When she went out, we went into her room inside which was full of toys and few pieces of cloths that she often kept arranging in different sequences. Out of the six states of an Avadhoot, is this state of Bal Avastha or the state of a child where the Avadhoot becomes childlike in complete innocence and unaware of his/her body and surroundings and devoid of any logic intelligence. This state was obvious by looking at the many number of dolls that lay in this room. We quietly left the place and when we were out on the road, two foreigners were asking about Amma’s whereabouts at the gate. I spoke with the girl for a few minutes whose eyes were impatiently hunting Amma. I suggested that she just sit in the house and meditate and if she wishes she will surely come, to which she happily told me that she comes once in six months there and she was living for long in Kerala, to which I understood that aspirants like these do not need any suggestions from anyone as they were already connected by higher powers that guided them. At that time, someone told me in Malayalam that Amma was seen sitting in an auto and going somewhere, which I translated to the girl. She did not seem to loose hope and bidding goodbye she walked away into the streets. We then got into the taxi and decided to go to Surya Narayanji’s Jeeva Samadhi at a little distance from here. He was a great Saint who lived in the house in which Amma now stays. Before leaving this home he had predicted that a great Avdhoot would come in this house. He later left his body a few kilometers from here. To read how we were last time mystically guided to His Jeeva Samadhi 3 years ago, click here. Amma turning to look at the lady of the house where Siddha Surya Narayanji lived. 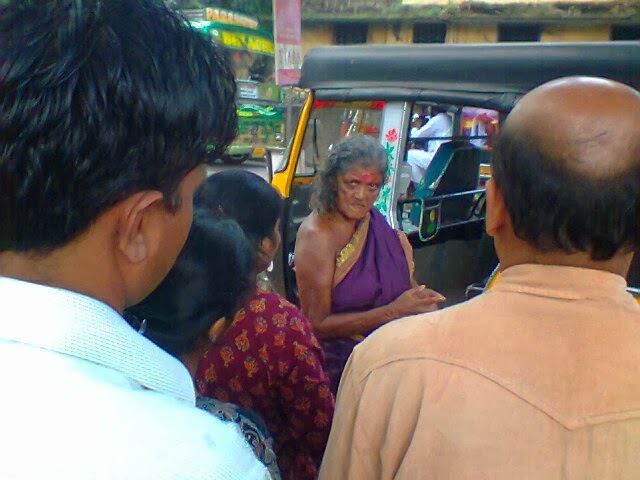 After standing out of the auto for five minutes, before people began moving towards her, she again went and sat inside the auto. The auto guy turned back to look at her and she raised her hand indicating him to leave and the auto reversed and soon sped off. I was literally amazed at this gesture of Amma. We were guided to drop the second bag of rice at Surya Narayan ji’s place. The lady of the home, who had herself come out running to meet Amma, told us happily that Surya Narayan ji and Amma often played such leelas. Then, we were told that Amma has headed towards her Samadhi Mandir near the beach to which I was taken back. Nothing of this sort had I heard before. We were told that today there was lunch provided to the poor there by Amma’s devotees and Amma has gone there. Since it was only a little distance, we decided to go there. 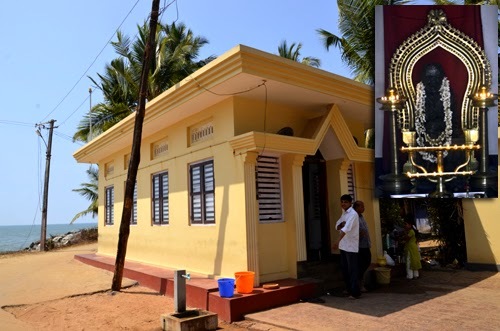 On reaching there, almost touching a little piece of beach where sea waves hit the shore, I was pleasantly surprised to see Amma’s Samadhi temple in which was her idol too. 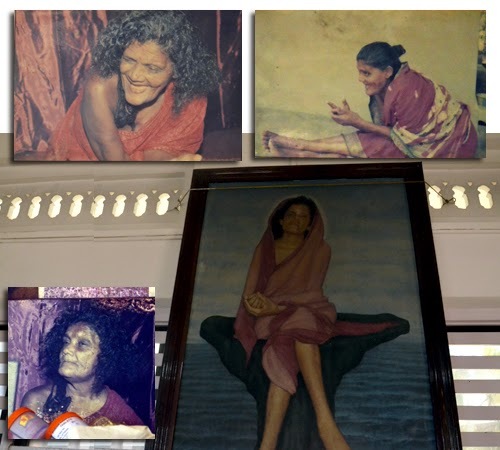 There were two very jovial photos that added beauty to the temple and one large painting of Amma sitting on a rock at the seashore at a much younger age. I just could not understand all this. I was told that this is going to be her Samadhi temple! Just then, Amma arrived in the same auto with the other two people with her, who were the devotees who were arranging the food and had built the temple. 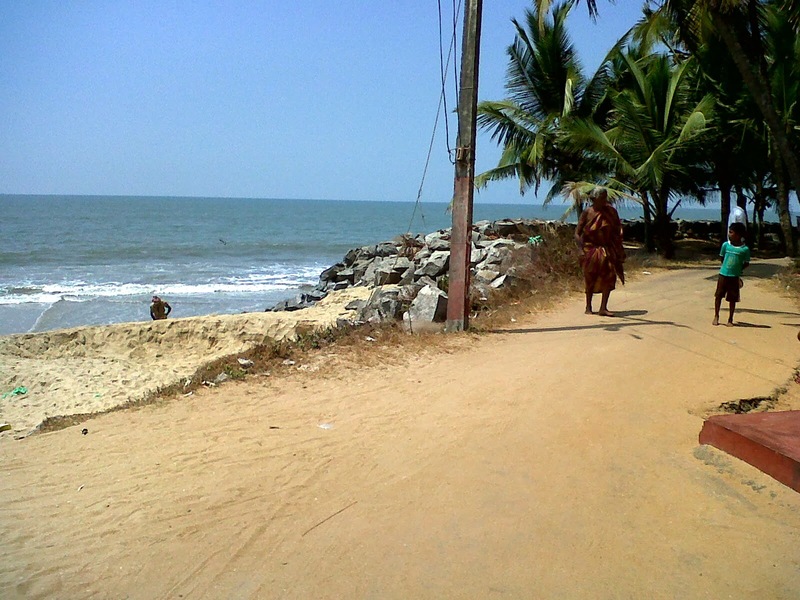 Amma walked around freely on the hot sand and deserted road beside the beach. We stared at her as she stared back at us as she walked around the temple as though supervising the entire thing. We then sat in the temple for a while and it was about 1:10 p.m. when we got up to take leave from the priest. He offered us Prasad and said that there was lunch at 1:30 but we said that we have to go far. He smiled and gave us Prasad but then something struck me as though it was Amma herself who mentioned us for the lunch. Why else would we have come there at that hour and that too on that day when they served it? Suddenly, changing mind I told her that we would wait for lunch to which he was pleased. We then decided to spend the 20 minutes at the beach. We played in the water, sat on the rocks, admired the nature, clicked photographs, laughed, played, joked and had fun, while at a distance Amma was often seen to come have a look at us and go. At 1:30 p.m. we went into the temple and the priest served us the food, while we saw people queued up for food at a little distance. The priest gave us food separately in the temple which we had with great delight. Washing and keeping the plates we enquired about Amma and were told she was lying down at the neighboring house. We went there and she was royally lying down in her own glory there. We touched her feet as a gesture of taking leave. I heartily thanked the Mother for all her love and blessings with all her unbelieveable plays and walked out of the open verandah of the house when I met the person who assisted her in the auto. He suddenly began speaking to me and telling me all about Amma. He said she was seen first on this beach bathing in the tides or the sea water. She roamed in these areas freely during those days when poverty was at it’s peak and was told that all the neighbouring villages had prospered and benefited a great deal from her presence there. He said the temple was built by her devotees at the cost of few lakhs that was impossible for the poor people to arrange from but with her blessing in some or the other form the materials flowed and it is what it is today. He mentioned about many leelas of Amma and also mentioned how she was once badly hit by a truck and hospitalized. She walked away from that hospital taken off all the hospital equipments hooked to her and threw all the medicines that were given to her and she miraculously recovered and continued her wanderings. Just then, I literally heard Amma get up saying “Chai, Chai” meaning “tea, tea” to which a few disciples rushed to her. She was now sitting up with the legs stretched in front of her and looking totally absent from the world around her. However, I noticed that Amma would periodically keep looking at few around quickly changing glances. The man told me that every Ekadashi, twice a month, they provide food to the poor. They also mentioned that the money or items in some or the other way reach the place for the meals, to which we were surprised as the third bag of rice we had dropped at this temple. He also mentioned about the wrath people had incurred who tried to play mischief with her. With this, I thanked him and took leave of him and went to Amma for a final touch of her feet in love and we all left, totally amazed by this turn of events. One thing I noticed clearly; while meeting her in Thalacheri, she was wrapped in a dirty saree but here for this ‘function’, she was wrapped in a new one :) Previously, we had the privilege of sitting for a few minutes with her but this time, Amma literally gave us company or took us around for half the day. Amma always walks alone totally being unattached to anything or anyone. She readily gets into autos or vehicles that she is welcomed into but steers away from many. She walks into homes unexpectedly but refuses to go with many who wish to take her home. She gives darshan to whom she wants and avoids others by not being present at home if she does not desire it. She mumbles with some and talks to some and gives gestures to some and silent to some. Her every act and gesture is only known to her and it is literally impossible to even write anything about Mahatmas. But this article I strongly feel, I was asked to share to let know about the angels of God who wander totally disguised in pitiable human forms admist places of poverty and suffering. This is to literally point out how difficult it is for the logic mind to even decipher the greatness of the nondual element of God presenting itself in so many confusing forms of duality. Then, we proceeded to meet Achar Baba in Quilandy. But something even more wonderful to mention about Amma is that after I returned back and was boarding a bus to go back to where I was staying, I received an email from my dear friend Vikas from UAE, who was from the place of Amma (Talacheri) and knew Amma and her leelas. He had written to me after I had published the earlier meeting with Amma, telling me more details about her, which I have mentioned in that post (read). This time he sent me what was to him a “latest photo of Amma”. When I opened the image, I was literally shocked for it was the photo of that foreigner girl meeting Amma! Somebody had updated him on this image from Thalacheri and he right away forwarded it to me. 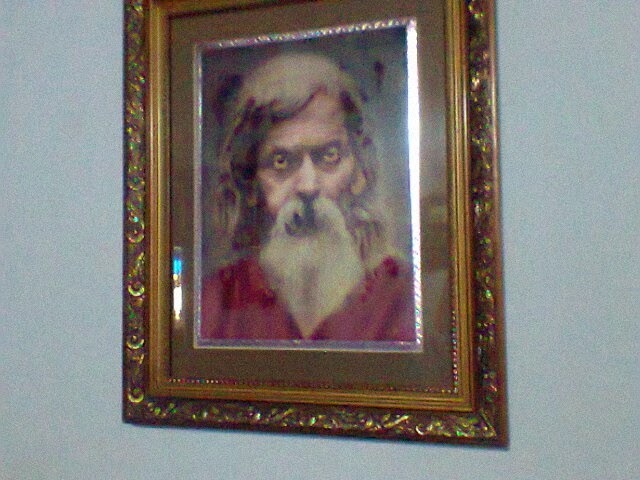 Soon, we reached Achar Baba’s place and had his darshan. He was sitting among the stinking food, just like the last two times I had met him, the last meeting being 3 years back. Back then, the experiences here were wonderful (read). Not many, come here because of the state in which they wish to remain. He sat there, dirty with one dirty piece of cloth wrapped around his waist with an unkempt beard but a glowing face, deeply engrossed mumbling something to himself. He did not like anyone touching him and moved promptly back if anyone did, sometimes even abusing badly enough to send the person away dejected and confused. For more than half hour he was with himself and some tried to talk to him and get his attention but to no avail. The person who took care of him was sitting besides me and he was the person who had told me last time everything about Baba and the working of the Gurumandala, which was fully astonished as to how an illiterate person knew so much, so accurately. This I was later told was that it was not he who speaks but Baba’s ways of communication. This was proved again this time. We sat with eyes closed and just meditated for quite a while. I was noticing that whatever thoughts were moving through my mind, his slow mumbling had those words in it. However hard I tried to understand it, it seemed impossible because of the rapid speed of the mumbling in Hindi that he was going on with. We clicked some photos of Baba, who looked very lean this time. I asked the serving man why was he looking so lean to which he promptly answered that Baba seemed to be eating very less since few months and that he had motions from past few days. He continued, “For the past few months, he has reduced his intakes and so have people coming there reduced, which looks like the karmic meetings with those whom he had to finish up with is coming to an end.” I was amazed at his quick reply, but then listened without judging. He asked me to come over to see something in the shed that the man lived behind this place where Baba sat. After walking behind him, I saw that he was showing me a temple the man had made out of agarbathi (incense sticks) packets that were offered to Baba. I clicked a few pictures of this temple, which I strongly believed was more than what was seen, especially since it came from the packets that were offered to Baba. I showed the pictures to others and we chatted a while because Baba was still engrossed in his own world. At that time, the serving man asked us if we needed some hot water. Offering hot water is common in Kerala. I refused. He again asked and others refused. When he asked for the third time if we would like to have a little, I did not want to take his words for granted, and suggested that we all go take the water. From a small alumininium pot over the chullah, the man dipped a steel glass and fetched hot water, which we turn by turn took and the man looked contended. We returned back to where Baba was sitting. At that moment, Baba suddenly asked one of us “Pani peeya?” (did you have water?) This was the biggest surprise. It was obvious that Baba was knowing everything. More than everything my heart said that it was he who had offered for the water in the first case. Seeing Baba being aware of his surroundings, we now turned towards him and sat. He continued doing what he was doing, picking food and thowing it back, searching packets of the old stale food, tapping his stick and continuing to mumble while scratching himself all over. I wondered how on earth can anyone even guess a fraction about such great masters. The serving man then came and sat besides me and started telling all the leelas of Baba. He told how he would put fire around him and laugh loudly amidst it. He would hop on to bikes and sit in the same position he is sitting on the back seat, with his face turned towards the back and ask the person to go ahead. Even though the person rode around, he would sit still without any signs of losing his balance. He told me that his states were many. Often he would be like a YOGI, sitting apt in one position and engrossed and sometimes like a BHOGI, eating and only eating away continuously and sometimes a ROGI, being diseased. He mentioned few other states also, one of which was childlike, during which times he played like a child. People offered all kinds of things to Baba and incense sticks were the most common one, perhaps people loved to have some good scented envoironment amidst the stale in between some were forced to sit. All kinds of people came to Baba and Baba was known to allow some and disallow few, even throwing stones or abusing before they reached him. Those who came to test him were subjected to few tricks by him that they were forced to leave or sometimes run away. Baba used to consume bottles of Achar (pickles) that were offered to him by people which is why he got the name Achar Baba. Then, he would at times eat only green chillies at a stretch. 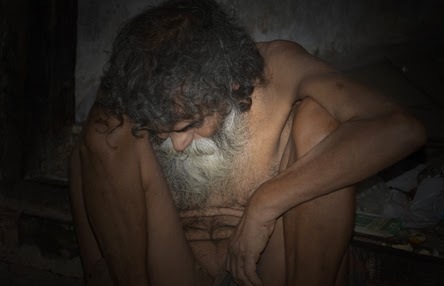 When people felt he was full, he would only surprise them by asking for rotis and omlette or fish, which he devoured and even asked for more, leading one to think where was it all going? Sometimes he would eat nothing. It should be noted, as mentioned in my previous blog on him, that people offered food to him as an act of offering their karmas to him, which he took, but not all. The stale food lying around were the food he did not touch. Sometimes he ate immediately what was offered to him and sometimes he ate it after weeks. Sometimes he tested people by offering them Prasad, by giving them stale chicken biryani or sometimes water that he washed his face with, by which people fled the place. 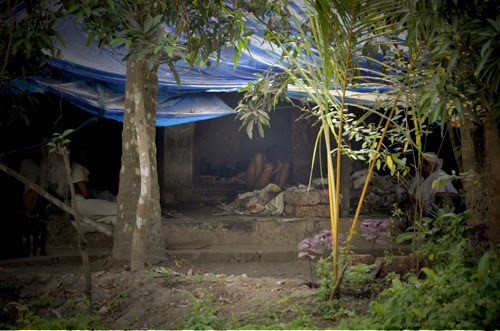 He mentioned about few people who were tested in various ways by asking them to stay overnight there with him at that shed and one person was even retained for more than a month there. Some obliged to him, some ran away. To some, there was no entry there and they were warned to sit at the railway tracks or the road besides it on the other side, but not to cross over from there to this place where he was sitting. Baba was totally unpredictable. Unpredictable to us, but he knew very well what he was doing and it all had meanings in depth. People often offered him food and sat there waiting for him to eat, some cried to him with their problems and some just visited him out of love. While all this conversation was going on, I saw a muslim couple had been sitting there for a long time and the husband was only holding on to the wooden support of the shed and staring at Baba continuously as though a lover stares at his lover in total engrossment and delight. He had this intense feel of love flowing through him on his face. I thought how blessed are these people who are blessed with the bhaav (emotions) of such intensity, even though being from a diverse religion. It only indicated some beautiful life-changing miracle that must have happened in the devotee’s life by Baba. I sat there, often connecting to my Baba (Baba Shivanand, my guru) due to whose grace we were even able to come there. How beautiful the feeling of oneness of all the great saints and masters were I cannot mention. The man then brought me more photos of Baba’s earlier days, which we took a snap of and which was an indication to me that it should be shared to all. Then, we decided to leave but then it would not be possible without his permission. Before we could speak, the muslim man went to Baba and said they wanted to leave to which Baba said clearly “2 minutes” and indicated that he sit down, which he promptly obeyed. We asked Baba if we could leave and he said “Jao, Jao” (go, go) and we were relieved to hear his permission. As each bowed before him, he had different expressions and different emotions and words and it’s pace. As I bowed before him, I could clearly hear a few words in Hindi he said to me. I was delighted by knowing that he knows it all, and so what if he mumbles. Then taking leave of the man serving him and offering him the bag of rice, we left the place, totally happy with this beautiful day’s events. We were also happy to note that it was good we had food at Amma’s Samadhi Temple, because there was no good food available in the stretch of this highway, since almost all hotels serve nonveg food. Before going back to Kanhangad, we also stopped in Vadagara at the Jeeva Samadhi of Shivananda Paramahamsa, a great master, whose many disciples also took Jeeva Samadhi in this ashram premises. They follow a very rigid and disciplined lifestyle but fully trained in mastering the senses and their bodies by vitalizing the prana. It was a long time desire fulfilled as we visited this Samadhi. 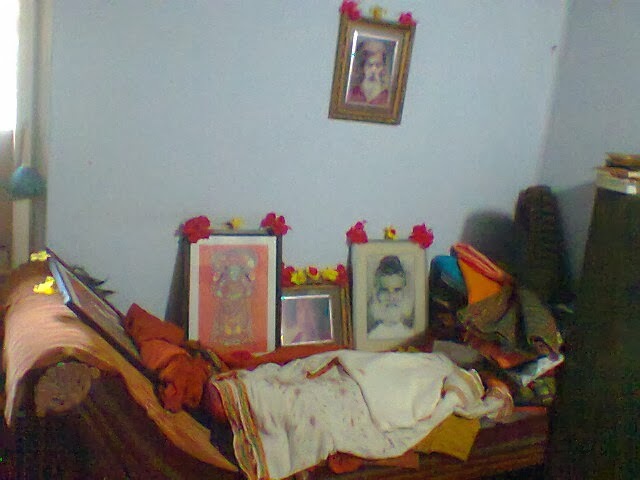 Swami Shivananda Paramahamsa was during the time of Bhagwan Nityananda and they often met and he took Jeeva Samadhi in Palani, and his body was brought here. Very powerful place it was. As we left an elderly Swami spoke to us kindly about all their lifestyle and processes. We took leave of him and left the place. I was reminded of Mohan Swami, the first ever Yogi I met in my life and had to the privilege to stay with and learn (read). 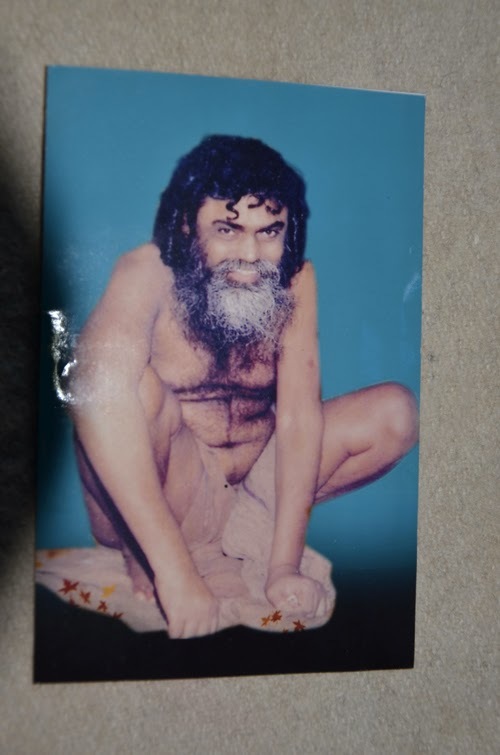 This divine person had a strange connection with the lineage of Bhagwan Nityananda, which I came to know later after meeting him a couple of times. He is a yogi fully in control of himself and still lives in Sogal at the place of many Jeeva Samadhis, alone. He is a very silent person and was the favourite of Govind Swami (direct disciple of Bhagwan Nityananda) whose Samadhi is in Ganeshpuri. Mohan Swami loved me and used to spare his time for me whenever I visited him in his hut on that hill in Sogal, Belgaum, and he was the first person I was blessed with to understand spirituality and it’s nondual element. Two years back, a Nityananda devotee from USA, Kris, was staying at Anandashram, Belgaum when even i was staying there for few days. When i was leaving back home, Kris had come to drop me at a bustand in Bailhongal. On the way to the bus stand, I was speaking to him highly of Mohan Swami. Reaching the bus stand, i got off the car and boarded the bus and the very next moment i sat at the window seat all of a sudden I saw Mohan Swami standing outside on the street. So stunned I was that no words came out of my mouth and the bus left. Later when i met him once and told him about the same, he only smiled. 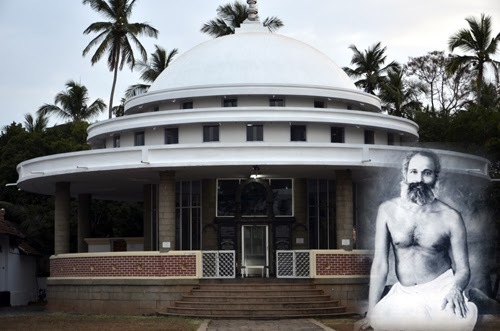 So, this Jeeva Samadhi at Vadagara, was of his Guru’s and this was the same ashram he was trained in. From there we moved back, halting at Kannur, to have dinner and move ahead to Kanhangad ashram. We were back at the abode of Bhagwan Nityananda by 10 p.m. fully relishing this priceless trip meeting two blessed beings and two Jeeva Samadhis. We hopped into bed and the next day was our final day of the trip, which we had planned to Guruvan. Next day, passed with us going to Padiyar Swami’s house and then going to Guruvan where we spent the whole day in that forest in the company of Swami Vidyananda. The details of these places and people are there in my earliest trips. I hurriedly noted down every detail of this trip so as to not miss anything from memory and wish that it be shared, of course, with His wish and for the pure benefit of all. This is a one-shot typing of events, which am not bothering to go back and correct, so kindly excuse the errors if any. A truly remarkable journey indeed and blessed too. Thanks a lot for sharing. HI! I just love your blog, as I once again feel like I am in India! My husband and I are devotees of Sri Ramana Maharshi and just came back from Arunachala last month. We miss it deeply. Thank you for sharing this beautiful blog. I can feel how very spiritual you are. A blessing in my life that i met both the saints in my life who is just an hour away from my home town. Amma mookambika blessings.